I've been thinking about the paradox of Joy for a long time. My first brush with it was in 9th grade----my catholic high school had hosted a two day on-campus retreat for the students. As my friend Janet and I walked home on the second day, we found ourselves contemplating the difference between happiness and joy. "Happiness is temporary" we concluded, "but Joy is eternal" Don't know if we used the word eternal, but we had hit on something. Sometimes a 12-year-old can be pretty profound. (We also discussed racial prejudice that day, a huge issue at the time, even though neither one of us knew a single black person in tame Ventura, California:-) Still, we were on the right track. "You know", Janet ruminated, "I think there are good black people and bad ones, just like with white people. You can't decide about someone based on their skin color". Seriously, we were really on the way to solving the world's problems. Unfortunately, puberty got in the way...........! Fast forward to the year 2000. 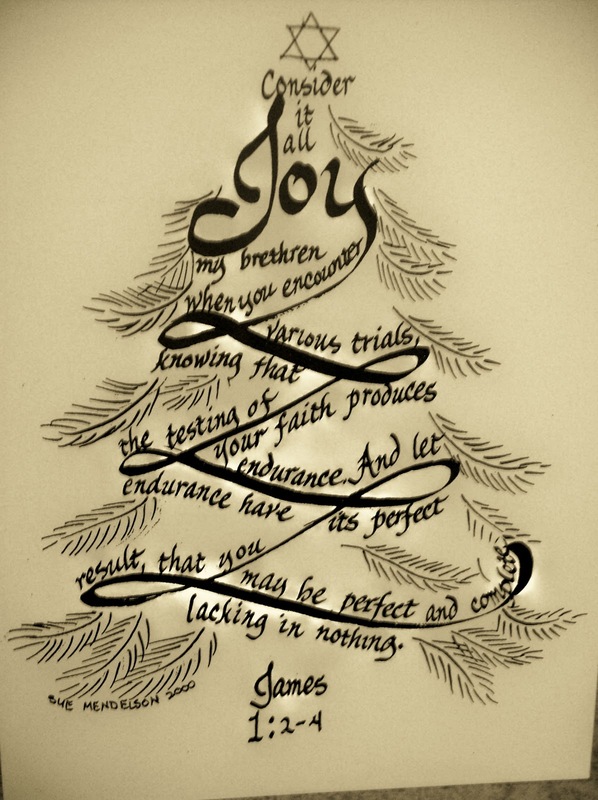 That's when this image of a Christmas tree, topped with Joy but woven through with the words of James 1:2-4, popped into my head. Considering the events of the past year, it seems to me to be a very appropriate image for my Christmas greeting to you all! Wish I could afford to send each and every one of you a handmade card, as I did that first year-----but the photo has some patches of light in it that don't appear on the original, and they make me think of Christmas lights. Joy is a surprising (to us) byproduct of suffering. "For the joy set before him" it says of Jesus in Hebrews 12 as it describes his death. C.S. Lewis titled his autobiography "Surprised by Joy" (put it on your reading list if you haven't already read it!) And as I walk through my own little trial here, I can testify personally that I have never seen God's face so often and clearly----and that is a lasting joy, his greatest gift to me. I guess that's what I want to end with, in this season of gift giving. We have been given an incomparable gift already, by the Definer of all giving! Praying that you all experience the joy! Blessings on you as you rest in Him this Christmas season, Sue and Stu.